While it’s not yet been proven how long a person can survive without water, experts agree that you can survive longer without food than water. It’s the most important resource we need as humans, but did you know that 844 million people don’t have access to safe water? So what does that have to do with our clothing? After the oil and paper industry, fashion is the third largest user of water. It is used throughout every stage of production from growing raw, natural materials like cotton to transforming cotton into yarn, from weaving yarn into fabrics, to dyeing and manufacturing, caring and washing your clothes, and finally when you dispose of your clothes. Cotton, for example, is one of the thirstiest crops grown for fashion and one of the most ubiquitous fabrics in your closet. Did you know it takes around 713 gallons of water to make one t-shirt? That’s enough drinking water to sustain one person for 1350 days or for 3.5 years. For those living in the U.S., that’s 713 of those giant jugs of milk you see in the grocery store. According to The Pulse of The Fashion Industry Report, by 2030 some nations (namely, clothing producing nations like China and India) may be so water poor that they are forced to choose between using available water supplies for crops for cotton, or for hydrating their population. So on this World Water Day, we want to share with you five ways you can be mindful with your closet and reduce your water usage. Wash your clothes with less frequency. A significant proportion of fashion’s water use happens at home in your laundry. How many of you are guilty of the throwing it in the laundry basket, so I don’t have to hang it up trick? (I sure am.) 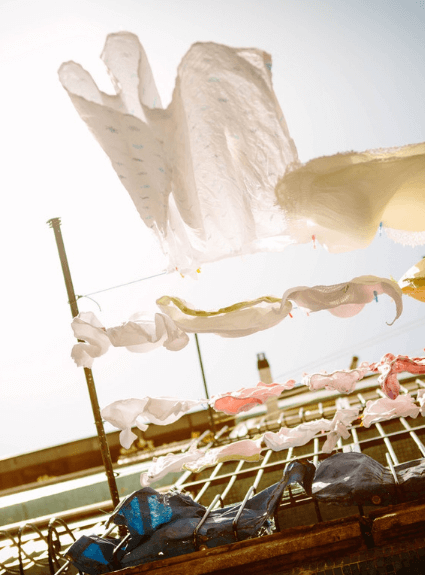 There are plenty of ways you can keep your clothes fresh and clean without water. Use gaffer tape to remove surface stains, spot clean with a little soapy water or spray it with vodka for those really stinky days. Wear the items more than once between washes, turn it inside out and air it overnight, invest in a steamer to give it a quick refresh. Also, instead of washing, try freezing your jeans. We wrote some tips about caring for your clothes in our dry cleaning article here. So next time you get home after a hard day of hustle and want to throw off all your clothes and chill, for the love of the environment—do the sniff test, check for small stains that can be spot cleaned immediately, and if they’re still good put them away for another day! Buy second-hand, rent for special occasions, and borrow from or swap with friends. When thinking about fashion’s impact on water we really need to talk about synthetic fibers. When washed, synthetic fabrics such as polyester, acrylic, and fleece shed tiny particles of fiber called microplastics that go into our waterways via the grey water from our washing machines and end up in our oceans, and our drinking water. In a recent study done by Orb Media, microplastics turned up in 94 percent of drinking water in the US. Currently, the best way to reduce your microplastics impact is avoid washing your synthetic fabrics as much a possible, if you absolutely have to wash them use a Guppyfriend bag. It collects the microplastics from your machine before they are washed away and you can throw them in to landfill. It’s not a perfect solution but it’s one of the few we have for now. Keep your items in circulation for longer. A pair of Levi’s 501 jeans uses almost 1,000 gallons of water in its life cycle. That’s enough clean drinking water for one person for 1,890 days in one pair of jeans. Levi’s is known to be one of the companies actively working to reduce their water usage, imagine the damage being done by companies, who are not innovators in this area. Every year you keep your jeans in rotation, and not just hanging in your closet more water saved. We created a tutorial last year about how you can use visible mending to not only extend the life of your existing denim, but also give it a bit of personality as well! If DIY is not your thing, investing in brands that will continue to repair your clothes for you is a wise idea. Nudie jeans are doing great things in this space as well as Eileen Fisher. Ask questions. Love a t-shirt or a brand but can’t find any information on it’s environmental impact? Contact the brand and ask them about the impact of their clothing. The power you have as a consumer to ask questions is one of the most important ways you can impact real change. Putting pressure on your favorite brands by asking questions about how they source their materials and make their products will lead them to look inwards and either take action or risk losing customers. The most recent Pulse report lists a number of business case studies which prove that making more sustainable choices is not only good for the planet, but great for their bottom line. Please share us with any tips you might have, we're always looking for new ideas on sustainable and environmentally-attuned practices.